Sales are not always about the price. Customers will spend more if they see the value and believe in the company that they are doing business with. A month ago, Dustin Gebers from Frontier Basement Systems in Clarksville, TN shared a story that is worth repeating. I went to a customer’s house the other day to follow up with him and his family, check on the job we completed, and to do a video testimonial. A year ago, we proposed a crawl space project to him for $9,643.83, which included Drainage Matting, Sanidry CX, CleanSpace and a SuperSump. The customer’s initial reaction was shock because the price was higher than other companies, but the value built into the system and our company’s reputation changed his mind and we moved forward with the project. DOWNERS GROVE, IL -- Perma-Seal Basement Systems is known best for being better because they offer the most advanced patented products and repair methods in the waterproofing and foundation repair industry. Consistently evaluating new solutions for their clients has made them the leader in the Chicagoland and Northwestern Indiana areas. That is why Perma-Seal is excited to announce that they now offer a new, innovative solution for unlevel and/or sinking concrete known as PolyLEVEL. Unleveled and sinking concrete around a home, building or business poses safety hazards and unwanted liability to the owner, customers, employees and/or tenants. Perma-Seal’s patented PolyLEVEL system can lift all types of indoor and outdoor surfaces including basement, warehouse and garage floors, driveways, sidewalks as well as patios, porches and pool decks. Last June, Perma-Seal began a basement waterproofing project at DuPagePads' Employment and Education building at 705 West Liberty in Wheaton, IL. The project was completed by September 2014. It was a big job which involved sealing off the basement area so that it wouldn't allow seepage inside. The basement of the building is used to store diapers, hygiene products, pads for sleeping, clothing, and more - all items which must be kept dry so that participants in their program can live healthy, safe lives. DuPagePads' mission is to end homelessness in DuPage County. They provide interim (overnight) housing and permanent supportive housing plans. A municipality in Illinois that lies adjacent to Chicago, Elk Grove Village is so-named for its herd of elk living in a grove in Busse Woods. Aside from the elk, the municipality is also home to the country’s largest industrial park, with over 3,600 businesses located within it. Sitting just beside Chicago, you can expect the climate in Elk Grove Village to be harsh in the winter, with thunderstorms common in spring and summer. 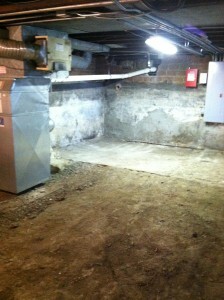 This makes many basements and foundation in the area prone to floods and water damage. A city in Illinois that lies just 40 miles southwest of Chicago, Joliet is the state’s fastest growing city with a population of about 148,000. Because of its proximity to the Windy City, it’s not hard to imagine that the climates for both cities are similar – that is, winters can be harsh, while thunderstorms are common during spring and summer. This can cause many basements to flood when the weather starts to get wet.